The ancient Mesoamerican ball game is very probably the oldest ball game in the world. We know that it was played with a rubber ball on a stone court, and that players would try to hit the ball with their hips, knees, and sometimes elbows and forearms around the court. Ballcourts often featured a stone hoop that was possibly the goal, but it is impossible to know if hitting the hoop was the only goal of the game. 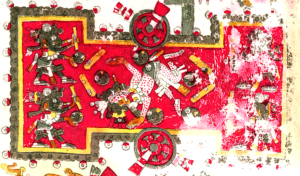 No written rules survive, though the game is mentioned multiple times in Popol Vuh, the written account of Mayan mythology. Contemporary mentions of the game often conflate it with human sacrifice, but it is impossible to know what, if any, role sacrifice played in the game. Oftentimes history writers have assumed that the loser was sacrificed, but we have no way of proving one way or the other whether that was true. It is entirely possible that human sacrifice was an integral part of the game, and it is also possible that it played no role at all.